This article is about the Apollo mission. For the aircraft, see FFA AS-202 Bravo. 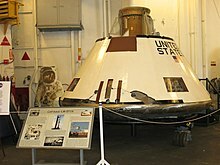 AS-202 (also referred to as SA-202) was the second unmanned, suborbital test flight of a production Block I Apollo command and service module launched with the Saturn IB launch vehicle. It was launched on August 25, 1966, and was the first flight which included the spacecraft guidance and navigation control system and fuel cells. The success of this flight enabled the Apollo program to judge the Block I spacecraft and Saturn IB ready to carry men into orbit on the next mission, AS-204. AS-202 was the third test flight of the Saturn IB, because a delay in the readiness of the Apollo spacecraft 011 pushed its launch past the July 1966 launch of AS-203. It was designed to test the rocket more than had been done on AS-201 by launching the rocket higher and having the flight lasting twice as long. It would also test the command and service module (CSM-011) by having the engine fire four times during the flight. The flight was also designed to test the heat shield by subjecting it to 260 megajoules per square meter. Over the course of the reentry it generated equivalent energy needed to power Los Angeles for over one minute in 1966. AS-202 was launched 25 August 1966 from Pad 34. The launch phase was perfectly nominal with the first stage burning for just under two and a half minutes, lifting the rocket to an altitude of 31.4 nautical miles (58.2 km), 30.4 nautical miles (56.3 km) downrange from the launch pad. The second stage then burned for a further seven and a half minutes, putting the spacecraft into a ballistic trajectory. The CSM was separated from the rocket stage at an altitude of 419.8 nautical miles (777.5 km). The CSM was preprogrammed to make four burns of its Service Propulsion System (SPS). The first occurred a couple of seconds after separation from the S-IVB second stage. It burned for 3 minutes, 35 seconds, lifting the spacecraft apogee to 617.1 nautical miles (1,142.9 km), 874.8 nautical miles (1,620.1 km) downrange. The second burn was 25 minutes later, lasting one minute 28 seconds. Ten seconds later, two more burns of three seconds each were done to test the rapid restart capabilities of the engine. The command module entered the atmosphere at a speed of 28,512 feet per second (8,690 m/s). The spacecraft performed a skip reentry, first descending to 36 nautical miles (67 km), then lifting back up to 44 nautical miles (81 km). By this time it had shed 4,300 feet per second (1,300 m/s) of speed. It then continued to descend. The main parachutes deployed at 23,790 feet (7,250 m). It splashed down at 16.12° N - 168.9° E, 205 nautical miles (380 km) from the target landing site, and the USS Hornet took 8 hours and 30 minutes to reach the capsule. AS-202 CM-011 exhibited on USS Hornet. The capsule is currently on display aboard USS Hornet. The ship is open to the public as the USS Hornet Museum in Alameda, California. Wikimedia Commons has media related to AS-202.